Dental Sealants protect teeth and prevent cavities. Children’s Dentist have effectively used dental sealants to prevent cavities since the 1960’s. Due to their shielding properties, sealants are beneficial in preventing cavities in teeth most prone to decay. According to the American Academy of Pediatric Dentistry (AAPD), nine out of ten cavities in school aged children for in the deep pits and crevices of teeth. Dr. Danny Hayes and Dr. Christine Mousa, of Advanced Dental Concepts in Crown Point, Indiana, recommend dental sealants to help protect the biting surfaces of teeth and keep cavities from forming. Placement of dental sealants by your children’s dentist is quick, painless and simple. Dental sealants are thin coatings of clear or tooth colored resin that are painted onto the biting surfaces of teeth in your children’s dentist office. The liquid coating are bonded to the tooth surface and hardened by curing with a UV light to form a protective coating. Traditionally, sealants have been used to protect permanent molars in the back of the mouth. However, the American Academy of Pediatric Dentistry (AAPD) promotes the use of sealants on other teeth, including non-molar permanent and baby teeth. The process of placing dental sealants is quick, painless and affordable. Dental sealants are extremely safe and effective in helping to maintain optimal oral health for your child. Sealants are not only protective and preventive, but cost effective as well. Protecting your child’s teeth from decay not only promotes good oral health, but prevents more costly restorative dental treatment in the future. Why Children Need Dental Sealants? As teeth form, the biting surfaces of all back teeth and others, inherently form deep grooves, pits and fissures. It is easy for cavity forming bacteria to colonize these crevices. Sometimes, these bacteria can not be removed, even with adequate brushing. The crevices are large enough for bacteria to invade, but may be too small for even a toothbrush bristle to clean. The colonization of these fissures can lead to dental decay. 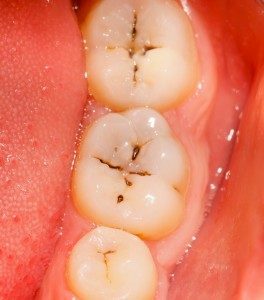 Dental decay in the pits and fissures. For this reason, dental sealants become imperative because they reduce the risk of the most common cavities in school aged children. Studies show, combined with regular dental visits to your children’s dentist and fluoride treatments, making the choice to seal your children’s teeth is one of the most effective ways to combat the threat of early childhood tooth decay. When to Place Dental Sealants? Talk to your children’s dentist to determine when to apply dental sealants, as each case is unique and varies. In some cases, baby teeth with deep grooves may require sealants to prevent decay. Remember that baby teeth serve an important function of holding space for permanent teeth. Premature loss of these teeth can cause future oral health and costly orthodontic problems. Children require sealants on all permanent molars as soon as they erupt. The first permanent molars will erupt between the ages of five and seven years old. The second set of permanent molars usually erupt around twelve years of age. Your child may also have permanent non-molar teeth with deep pits and grooves that require sealing. For a simple and inexpensive procedure, children typically receive two to five years of protection against the most common childhood cavities. In the most ideal circumstances, some sealants may last as long as ten years. Your children’s dentist should check the health of all existing sealants at your child’s regular dental visits. When searching for your children’s dentist, consider Dr. Danny Hayes and Dr. Christine Mousa of Advanced Dental Concepts in Crown Point, IN and Portage, IN. At Advanced Dental Concepts, we provide comprehensive dentistry for patients of all ages and are always welcoming new patients. If you are looking for a children’s dentist, or a dental practice that your whole family can call your dental home, contact us to schedule an appointment.